EUR/USD continues to have an uneventful week. On Wednesday, the pair is trading at 1.1308, up 0.24% on the day. On the release front, eurozone CPI dipped to 0.8%, matching the forecast. The eurozone trade surplus jumped to EUR 19.5 billion in February, its highest level since April. There are no major U.S. events on the schedule. Thursday will be busy on both sides of the pond. Germany and the eurozone release services and manufacturing PMIs, and the U.S. posts retail sales and umemployment claims. Eurozone inflation is steady, but remains well below the ECB target of 2.0 percent. The eurozone annual inflation rate edged lower to 1.4% in March, compared to 1.5% in February. Low inflation means that the ECB is not under pressure to raise interest rates. After last week’s policy meeting, Mario Draghi noted that the economic outlook for the eurozone remains weak. 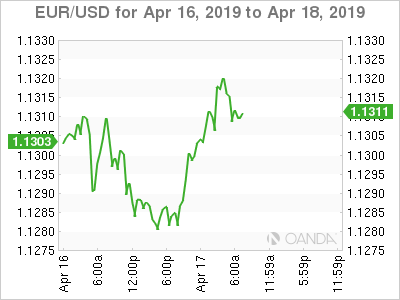 With no interest hikes in sight and a sluggish eurozone economy, the euro will have likely have trouble making headway against the U.S. dollar. There was positive news from the German ZEW economic sentiment survey, a key gauge of investor confidence. The indicator has been mired in negative territory for the past 12 months, and finally climbed into territory in April. The score of 3.1 points to slight optimism on the part of institutional investors and analysts. The eurozone indicator showed a similar trend, climbing to 4.5 points, its first gain since May. The improvement in investor mood is attributable to the Brexit extension, which will give the parties time until October to try to reach a resolution to the deadlock. The ZEW said that investors were hopeful that the global economy would develop “less poorly” than expected. At the same time, eurozone growth remains weak and Germany is expected to cut its growth forecast for 2019. This is largely a result of the global trade war, which has hurt the German export sector.